Have you ever wondered whether the man standing in line behind you at the grocery store might be a spy? Watch his eyes. Doesn’t he seem shifty? He must have received an urgent message from headquarters and he’s trying to seem inconsequential. Maybe his mission has been planted on the interior of that toilet paper roll he’s buying. His informant likely wrote the message in disappearing ink and once it’s unrolled and exposed to the air, he’ll know what he has to do next. Espionage is intriguing, and people love to read the stories of heroes who inhabit the pages of spy novels. Enthusiastic readers flock to the International Spy Museum in Washington D.C. in order to learn more about their favorite spies—both real and make believe. “Ashenden or The British Agent” by Somerset Maugham is widely accepted as the book that helped to shape the genre of what is known today as the spy novel. Museum visitors take on secret identities as they make their way through exhibits showing a world where a shirt button, wristwatch, or hairbrush holds a camera, and an umbrella or lipstick case is a deadly weapon. Deception is reality. For book lovers, a pair of libraries adds to the intrigue. One is viewable by the public and a second library holds primary resources for museum staff only. “There is a long tradition of interplay between the world of literature and the world of espionage,” says Stout. And because spy fiction is subtly tied to truth, museum founders created The Library Room, accessible to exhibit visitors, to help clear up the confusion between fact and fiction. The room is “devoted to the intersection of the real-world of spies and fiction writers,” Stout explains. The Library Room houses titles like those written by William LeQueux, a spy fiction writer and Anglo-French journalist. According to Dr. Stout, LeQueux’s wildly popular books, written in the early 1900’s, were based on “thinly veiled fact about the German spy threat” prior to World War I. There was not much truth to support his paranoia about the Germans, yet the popularity of his books created concern for both the public at large and the British m ilitary. Enough interest was piqued, in fact, that British officials sought out LeQueux’s expertise and invited him to be a consultant for the military. Partly in response to the buzz created by LeQueux’s writing, the British military created its first British Intelligence agency in 1909. LeQueux is an exception to what has evolved as the rule for most other fictional spy writing. 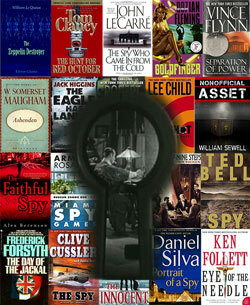 A number of fiction writers, such as Somerset Maugham and Ian Fleming, were spies before they became writers. The Library Room offers a space where the real story of their lives as spies can be shown in parallel to the books they wrote. 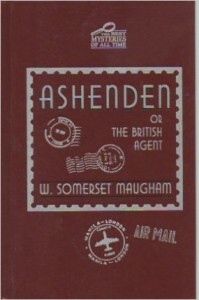 Ashenden or The British Agent by Somerset Maugham is widely accepted as the book that helped to shape the genre of what is known today as the spy novel. Maugham, inspired by his work as a British Intelligence agent in Russia during World War I, fictionalized and exaggerated experiences, while launching readers toward more interest in both spy literature as well as the real-life experiences of a spy. The popularized spy novel has continued to grow an interest in espionage, and none possibly more influential than Ian Fleming’s books about James Bond. Fleming’s stories were influenced by his real-world experiences as a British Naval Intelligence officer. Even the story about how Fleming decided on the name for his main character involves an interesting real-life back-story. Fleming wanted a boring, generic, and strong English-sounding name, but he wanted it to be bland enough to belong to someone who wants to remain unnoticed. While vacationing at his estate in Jamaica, Fleming stumbled upon a book on his shelf called Birds of the West Indies by James Bond. The author’s name was evidently boring enough to take on the mysterious identity of what would become one of the most popular spy names in history. The depth of information housed in the museum cannot exist without primary resources so, in true espionage fashion, there is a second library at the museum, of more than 3200 books, that is not accessible to the public. The books in this staff-only section of the museum are a combination of primary sources, nonfiction texts, de-classified information, and biographies. Stout says, “Books are an intrinsic part of our function.” As the historian on staff, Stout visits the “secret” library practically every day, and sometimes multiple times a day, to verify and/or investigate inquiries. The museum receives requests for information from researchers around the world who are interested in corroborating evidence or validating similar research. The decision to include books as such an integral part of the museum’s function was due in part to the influence of a pair of real-life spies who were among the founders of the museum. Husband and wife, Tony and Jonna Mendez, both CIA operatives before retirement, are members of the International Spy Museum’s Advisory Board of Directors and Advisory Council. Tony is the CIA agent who orchestrated and carried out the rescue of Americans during the Iranian hostage crisis. 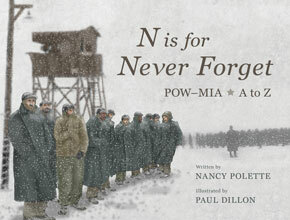 His story is the subject of the award-winning film Argo. Both Tony and Jonna supported the idea of including books among the resources at the museum. “We’re going to need a library,” Jonna said, and together with retired CIA Deputy Director Tom Twetten (currently an antique bookseller in Vermont), they built the core of the collection of books kept in the museum. Spy work is dependent upon secrecy, and it makes sense that part of the work for the International Spy Museum would be dependent upon a secret stash of books, too. Together with the fiction books that have helped to popularize espionage for the public, the full story of what it is to live the life of a spy comes together in the rooms and on the shelves of the pair of libraries. 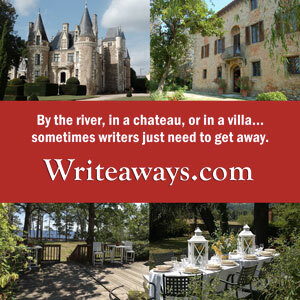 Meagan Frank is senior writer for Books Make a Difference and is working on her first novel. www.MeaganFrank.com This article was originally published as a subscriber-exclusive in April 2013.